The other day Ian sent me a text asking something about the new Beans editor, and I didn’t know the answer without having the editor in front of me to fiddle with. What I needed was a new post with some words in it. So I opened the Beans, made a new post, and started typing some nonsense to fill up the screen. I just closed it when I’d seen what I needed to see, but next time I came here, my nonsense was still there, faithfully saved for me by the kindly Beans. At first I thought that was just because of some kind of auto-save function, but then I read it and realised: no. This was no automatic save. The Beans had seen what I had typed and recognised it for what it was. Sheer poetry. It calls to mind the most uplifting words in the English language. So, rather than keep it to myself, I have chosen to publish the words I wrote below, so that you can enjoy them too. I have chosen to title this, simply, “Untitled”. You besmirch my good name, sir. 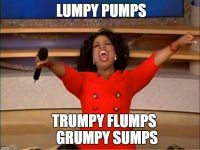 I actually posted it because the line “lumpy pumps” made me laugh and still does. Now if it were the last couple of days before the end of the month then I’d say this was shameless filler. Halfway through the month? Nen chance. Exactly. I had YOUR best interests at heart, not my own sordid needs. Those last three lines are killer. You need your own inspirational poster, with cosy sunset, for words as good as this. 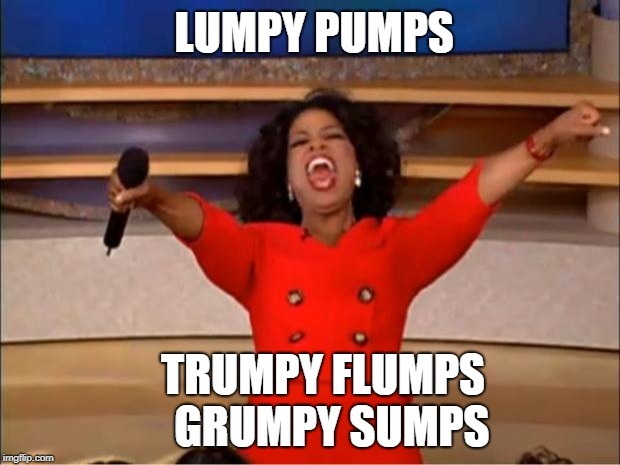 Lump Pumps for you, Trumpy Flumps for you, Grumpy Sumps for everyone! It’s a bit too in-your-face. It needs to be more mellow. More mellow? I have just the thing. This made me laugh so hard I had to explain the whole thread to both Reuben and Emma. It’s a shame there aren’t another four panels of it so the whole poem could just be a redneck argument. Sometimes you have to just accept your limitations, and that is probably mine. Could you not do a “Papples” and sort of loop the pictures, copy and paste some others, and fit the whole shebang in one go? Is that what a cut-and-shut bodge job is called now? Doing a Papples? What a proud legacy. It works for me. How many of our songs worked out that way? How many albums have we hung from that very premise? I think they all had elements of that, whether it was taking a saw to someone else’s carefully crafted music and nailing it into a new shape to fit one of our songs, or jerrymandering one of your poems to turn it into an ill-advised song lyric. They were all Pappled to some degree. We “pappled” the shizz out of everything we touched. Also, jerrymandering? The bees are in the what now? Sorry. Gerrymandering. Turns out it’s spelled with a G. That’s why you’re confused. Yep, that’s exactly what threw me. Had you not done that I would have know precisely what you were yapping about. Good. Glad we got that straightened out. Apparently is supposed to be pronounced “Ge-rry-mandering” after the guy who coined the phrase who pronounced his name /???ri/. (Wikipedia) Having said that, your new, revised, spelling is bob-on.